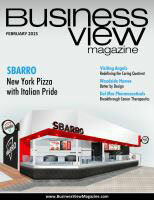 CEO: Sbarro re-emerging with “a new lease on life”. As chief executive officer at Sbarro since early 2012, the restaurant/franchising veteran has helped steer the now 59-year-old business through a tumultuous stretch he concedes may have “tarnished” the brand, though he insists it simultaneously cleared the way for a rapid recovery. The initial stages of the process yielded tweaks to menus and designs across a roster of 625 franchise locations and 200 corporate stores, alongside a re-steering of the brand’s position back toward a longstanding pizza-centric legacy that had already made it the world’s sixth-largest pizza chain. Karam said marketplace testing of the refined “New York-style” and “pizza by the slice” elements has been very positive, and that substantial traction has already been gained from the company’s decision to go back to items that are most authentic to its mid-1950s heritage. Much of the steam-table food options were eliminated from menus in favor of emphasizing fresh-made pizzas and strombolis, a made-to-order pasta offering, contemporized beverage offerings and salads. And, because Sbarro is already such a prominent name in such a broad restaurant category, it won’t take a whole lot of market share progress to yield significant sales and growth opportunity results. “Pizza’s a big category and we’re a big player in pizza,” Karam said. Now, he said, the task shifts to reinvigorating growth. Much of Sbarro’s recent expansion has been international in nature, with 75 new stores opening in 2014, following 68 in 2013 and 60 in 2012. Meanwhile, the objective is to try and reverse a trend of domestic stagnation in the U.S. over the same three years, by doubling-down on its wheelhouse sites – in malls, casinos, airports, travel centers, downtown business districts and college campuses – while seeking out smaller-footprint sites where people are more naturally inclined to eat pizza by the slice and carry-out pizza. “Those are opening up new growth opportunities for us domestically,” Karam said. The first franchisee conference since the company emerged from bankruptcy and relocated its corporate headquarters to Columbus, Ohio took place in October, and the recovery process was further validated by strong attendance from both domestic and international operators. In fact, he said the tumult of the last few years hasn’t at all negated interest from new candidates. “It’s not been a problem at all,” Karam said. Franchisee candidates are required to have a minimum net worth of $1 million – excluding their primary residence – and $350,000 in available liquid assets. The franchise fee is $25,000 for a 10-year agreement, with a 5 percent royalty and a 2 percent marketing fee. Typical start-up costs include between $80,000 to $150,000 for equipment and fixtures, $5,000 to $7,000 for opening inventory, $8,000 to $10,000 for training expenses and $1,000 to $5,000 for the grand-opening package. Construction costs and leasehold improvements vary by site. Going forward, making sure the company is franchise-friendly is a priority. Keeping the concept relevant in the marketplace and appealing to customers is job one toward that aim, and it’s followed closely by ensuring franchise partners continue to feel good about their association with the brand, the corporate leadership and the operation’s overall integrity. Check out this handpicked feature on Otto Pizza – What a slice!